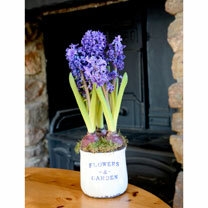 Delightful ceramic planter perfect for windowsills, with 3 fragrant hyacinths. 12cm diameter. Delivered in bud in December, flowers in 2-3 weeks depending on room temperature. 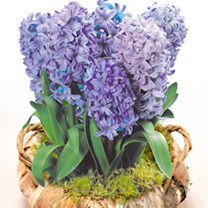 A striking birch planter with exquisitely perfumed blue hyacinths. Brighten up the festive season with a beautiful display of indoor bulbs. 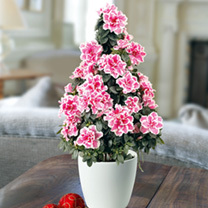 They are supplied in bud and will quickly burst into bloom! 30cm diameter. 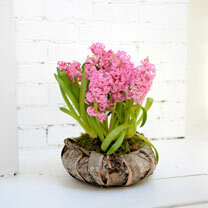 A striking birch planter with exquisitely perfumed pink hyacinths. Brighten up the festive season with a beautiful display of indoor bulbs. They are supplied in bud and will quickly burst into bloom! 30cm diameter. 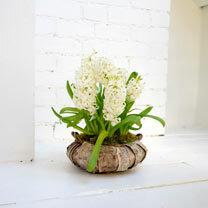 A striking birch planter with exquisitely perfumed white hyacinths. Brighten up the festive season with a beautiful display of indoor bulbs. 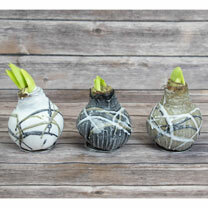 They are supplied in bud and will quickly burst into bloom! 30cm diameter. 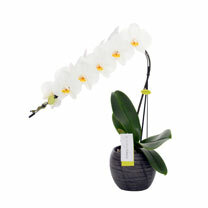 A stunning cascade of phalaenopsis orchid, pure white blooms with sunny yellow centres. Complete with elegant ceramic pot, this beautiful orchid, with a waterfall of white flowers, has something mystical about it! Beautiful eyecatcher for any room. 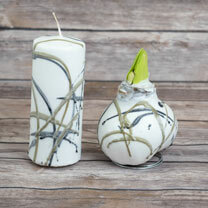 Waxed amaryllis with attractive painted design complete with a candle in the same design. Neutral colours to suit any colour scheme. A perfect gift. 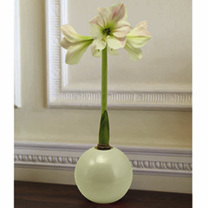 Waxed amaryllis with unusual painted design, which blooms in 3-5 weeks without a drop of water. They come in three attractive neutral colours - which one you get will be a surprise. 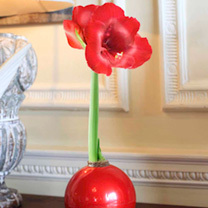 Waxed amaryllis with unusual painted design, which blooms in 3-5 weeks without a drop of water. They come in three attractive neutral colours.